Khris Middleton broke out of an early season shooting slump by pouring in a career high 43 points, but it wasn’t enough to prevent the Milwaukee Bucks from falling to the Charlotte Hornets 126-121 in Charlotte. 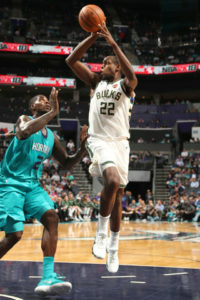 The Bucks knocked down a franchise record 19 three-pointers, but they couldn’t stop the Hornets defensively. The two teams were tied at 88 when rookie guard Malik Monk got hot, scoring 18 points in the fourth quarter to finish with 25. Giannis Antetokounmpo came into the game having scored at least 28 points in each of the first seven games. The Bucks star finished with 14 points on 5 of 16 shooting. The Bucks are off today and will continue their road trip at Detroit on Friday night.